(See E.123, 1 – 2, Anonymous, Loves of the Gods (the Milan-Boyvin set): Pluto and Proserpina and Saturn and Philyra, discussed under Caraglio, E.46-47). 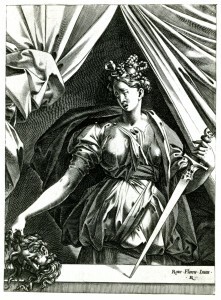 Engraving by René Boyvin, 18 x 13.1 L (Vienna). Inscribed on top of ledge at lower right: Rous . Floren . Inuen . / . B .
Robert-Dumesnil, VIII, 1850, 18, no. 1, as Boyvin after Rosso. Le Blanc, 1854-1890, I, 506, 1, as Boyvin after Rosso. Levron, 1941, 65, 1, as Boyvin after Rosso. COLLECTIONS: Lyons, exhibited (private coll., Dunand, 1973, no. 22, Fig. 16). Paris, Ed 3; Boyvin SNR. Vienna, F.I.3, p.1, no. 1. Kusenberg, 1931, 102, 160, Pl. LV (Paris, Ed 3) as Boyvin after a lost painting by Rosso. Barocchi, 1950, 252, Fig. 233 (Paris Ed 3). Oberhuber, 1967-1968, 187, no. 276. Cox-Rearick, 1972, 35, 37-38, no. 44. Carroll, 1975, 19, Fig. 2. Carroll, 1978, 28, 32, Fig. 12 (Vienna). Borea, 1980, 262, no. 672. Hirst, 1981, 79, n. 18, as after a lost early French painting by Rosso, the parapet related to that in all forms of Venetian easel painting. Darragon, 1983, 12, as Rosso in France. K. Wilson-Chevalier, in Fontainebleau, 1985, 169-170, no. 112 (Paris, Ed 3), as Boyvin after Rosso, and preserving the appearance of a picture he painted for Francis I.
Carroll, 1987, 44, 180-182, no. 59, with Fig. (Vienna). Goldner, 1988, 108, the design by Rosso perhaps of the late 1530s because of the similarity to the Empedocles-St. Roch in the Getty Museum. Scalliérez, 1992, 17, 18, Fig. 10, as possibly related to Rosso’s lost painting once at Fontainebleau. Franklin, 1994, 150, Pl. 114 (Vienna), as probably recording an early French painting by Rosso. 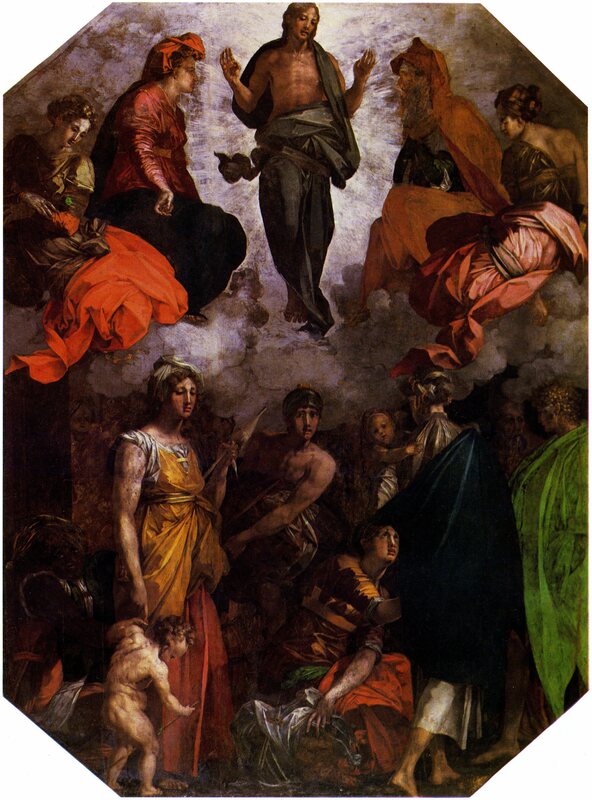 This print, inscribed to Rosso, is now generally thought to be derived from a lost painting by Rosso that Cassiano del Pozzo saw at Fontainebleau in 1625. On this painting, see L.35, where it is suggested that it was painted in 1530-1531. 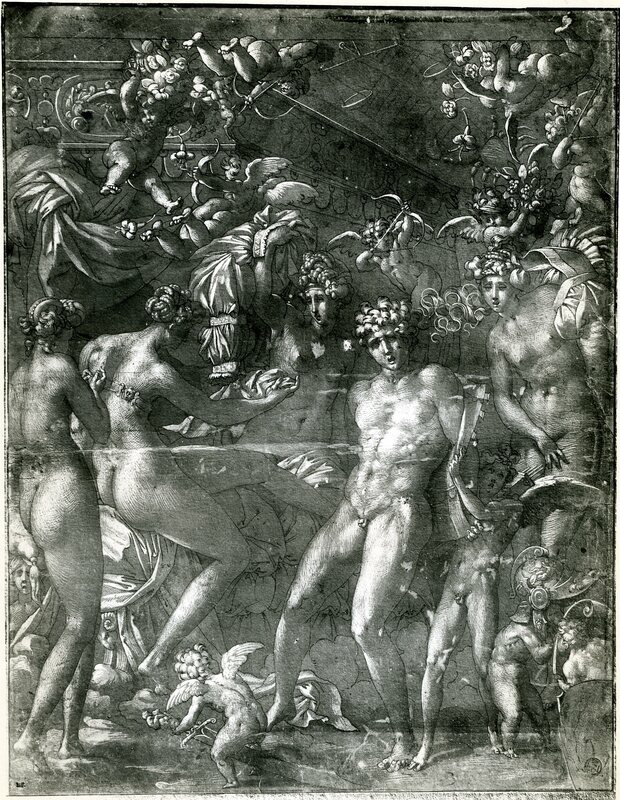 Stylistically, the image of the engraving is most closely related to Rosso’s Christ in Glory in Città di Castello (Fig.P.20a), completed in the spring of 1530, and his Mars and Venus drawing (Fig.D.42a), done in the summer of 1530 just before he arrived in France. It is probable that the print reverses the original lost image. Boyvin’s authorship of this engraving, which bears his monogram, has never been doubted. Levron (1941,19) suggests that it is an early print by Boyvin, done around 1550-1555, but in the present state of our knowledge this cannot be verified. The details of the print suggest that it reproduces Rosso’s work very well. But it is likely that Boyvin in Paris worked from a drawing by Rosso, or an accurate copy of one, rather than from the lost painting itself, which was at Fontainebleau. Less likely, he worked from a drawing made from the lost painting.